PatientCareLink now provides CMS Home Health Compare data on Home Care Alliance of Massachusetts’s individual home healthcare agencies. Data includes rates on performance, including timely initiation of care, patient/family medication education, depression assessment, and more. 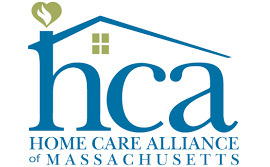 Home Care Alliance of Massachusetts is a non-profit trade association of home care agencies that promotes home care as an integral part of the health care delivery system. With 48 years of experience their mission is to "unite people and organizations to advance community health through care and services in the home." The Alliance has Agency Members from Boston, to Provincetown, to the Berkshires, as well as dozens of Allied and Individual Members. Membership is voluntary – the Alliance is not a government entity – but provides essential resources to its members to help stay informed and thrive. Home healthcare can include a broad range of treatments and services that are provided in a patient's home or residential setting. Home healthcare may be delivered by skilled medical professionals including skilled nurses, physical and occupational therapists, and speech therapists. It can also include skilled non-medical care, such as medical social services or assistance with daily living from a highly qualified home health aide. PatientCareLink (PCL) provides data about the quality and comprehensiveness of home healthcare offered in Massachusetts. Home health agencies across the Bay State are committed to quality improvement and use PCL data to measure their performance and improve care. This information should be reviewed carefully and used with the other information gathered about home health agencies through agency interviews, as well as references from doctors or other trusted sources.